Figure 1. 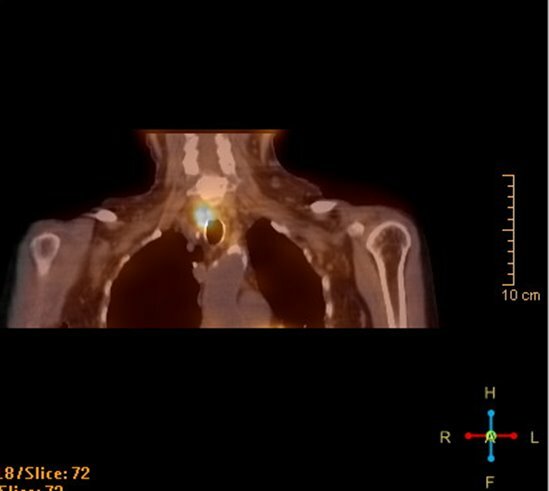 Parathyroid scan of the patient shows focal increased activity posterior to the lower pole of the right thyroid lobe. This is a case involving a 64-year-old woman with end-stage renal disease (ESRD) due to lupus nephritis who has been on hemodialysis for 7 years. She also has dementia, hypertension, obstructive sleep apnea on CPAP, and stage 1 non-small cell lung cancer post wedge resection. Over the past 12 months, her secondary hyperparathyroidism (SHPT) has become increasingly difficult to control. Intact PTH (iPTH) was persistently over 1000 pg/mL (normal range 16-80 pg/mL). The highest iPTH value was 2678 pg/mL. Serum calcium ranged from 8.2 to 10.1 mg/dL. Serum phosphorus ranged from 4.9 to 7.3 mg/dL. Alkaline phosphatase increased from 222 to 551 U/L (normal range 35-104 U/L). The woman lives with her daughter, who is also her caregiver and does most of the cooking. The patient does not pay attention to dietary phosphorus intake and she snacks on foods readily available at her residence. Due to dementia, she often forgets her medications, including cinacelcet and phosphorus binders such as sucroferric oxyhydroxide and sevelamer. The renal team met with the patient and her daughter and provided extensive counseling on renal diet and medication compliance. After that, the patient’s daughter took up the task of managing the patient’s medications and reported excellent compliance with medications and low phosphorus renal diet. The cinacalcet dose was gradually increased to 90 mg twice a day. Calcitriol was continued at 0.25 mcg 3 times a week during HD sessions. However, the patient’s iPTH remained elevated above 1500 pg/mL. The patient’s most recent lab results showed a serum calcium level of 10.2 mg/dL, phosphorus level of 6.4 mg/dL, iPTH level of 2257 pg/mL, and alkaline phosphatase level of 551 U/L (normal range 35-104 U/L). 1. Lau WL, Obi Y, Kalantar-Zadeh K. Parathyroidectomy in the management of secondary hyperparathyroidism. Clin J Am Soc Nephrol. 2018;13:952-961. 2. Schneider R, Slater EP, Karakas E, et al. Initial parathyroid surgery in 606 patients with renal hyperparathyroidism. World J Surg. 2012;36:318-326. This patient has had persistently elevated iPTH and hyperphosphatemia despite maximal medical treatment. She can benefit from a more strict diet and increased dose of phosphorus binders to reduce hyperphosphotemia. However, at this point, she likely has developed irreversible nodular hyperplasia. A parathyroid scan is indicated to confirm this. Once a parathyroid scan confirms localized hyperactivity, subtotal or total parathyroidectomy is indicated. Doubling the dose of calcitriol or changing to another form of active vitamin D is not appropriate since the patient is already borderline hypercalcemic and her serum phosphorus has been elevated. Increasing the dose of active vitamin D will worsen hypercalcemia and hyperphosphotemia, thereby increasing the risk of vascular calcification and calciphylaxis. The maximal dose of cinacalcet is 90 mg twice a day. There is no clear evidence that etelcalcetide, an IV counterpart of cinacalcet, is superior.